IOWA CITY, IA–North Dakota State kicker Cam Pedersen drilled a clutch 37-yard field goal on the final play of the fourth quarter to lift the Bison to a stunning 23-21 victory against the Big Ten’s returning West Division champion Iowa on Saturday. The sellout crowd of 70,585 fans in Kinnick Stadium–the largest crowd to see NDSU play– saw the FCS powerhouse play a similar style to that of the home team Hawkeyes in a power running attack but Iowa appeared as if it may sneak out with a victory. NDSU quarterback Easton Stick hit running back Chase Morlock on a 7-yard touchdown pass to bring the Bison within 21-20. The Bison then went for a 2-point conversion with 3:41 left in the game, but Stick’s pass went incomplete. The Bison defense gave its offense one last chance. however, as Iowa went three plays and out on the ensuing possession. NDSU safety Robbie Grimsley sacked Iowa quarterback C.J. Beathard on a third-and-11 play to force a punt. NDSU received the final possession with 1:53 left in the game. The drive started with an impressive Stick quarterback draw up the middle for 29-yards. The Bison drive continued and advanced to the Iowa 20 yard line before calling a timeout with 5 seconds to go. Pedersen delivered the game-winner just inside the right upright as time expired and NDSU stormed the field to celebrate in front of an estimated 8,000-plus Bison fans. The loss was just the fourth by a ranked FBS team to an FCS school. 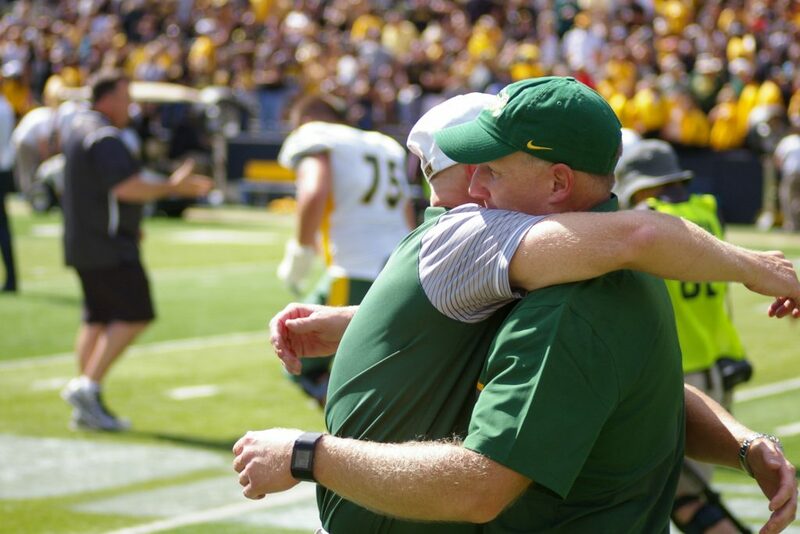 It was NDSU’s sixth straight win over an FBS school with the prior wins coming against Kansas, Colorado State, Minnesota, Kansas State, and Iowa State. 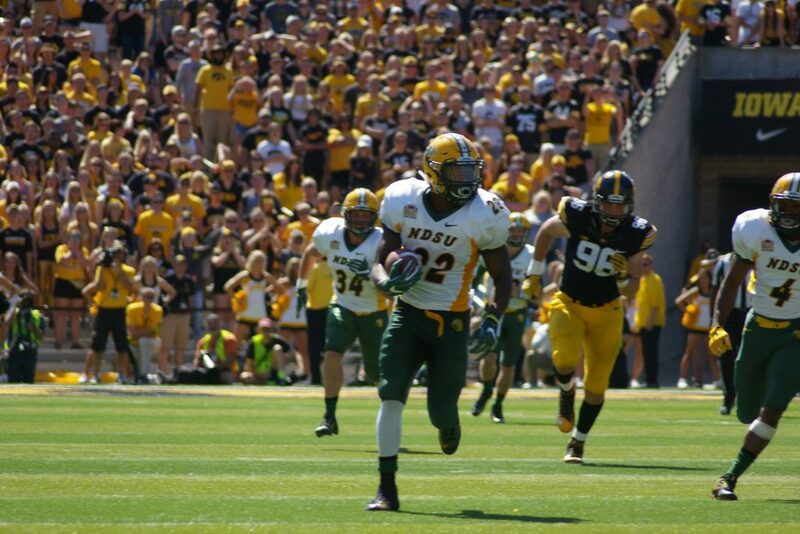 Against the Hawkeyes, NDSU ran for 239 yards and held Iowa to 231 total yards. North Dakota State’s defense was at its best on Iowa’s final drive, sacking Iowa’s C.J. Beathard to give its offense one more shot. “As an offense we preach: if we get the chance to end the game with the ball in our hands, we have to do it. We believe in Cam and we knew if we got the ball down there he could do it,” Stick said. Beathard had three TD passes for Iowa (2-1). But the Bison limited the Hawkeyes for just 34 yards on the ground on 25 carries. NDSU’s first touchdown came on MJ Stumpf’s 21-yard interception return with 2:26 left in the first quarter. Fellow linebacker Pierre Gee-Tucker hit Beathard from his blind side and the quarterback’s pass popped in the air to Stumpf, who had open space to the end zone and a 7-0 Bison lead. Iowa then scored the next two touchdowns on passes by Beathard. The Hawkeyes first score came after Beathard connected with VandeBerg for a 15-yard gain into Bison territory and on fourth-and-2 from the 30, Beathard hooked up with Riley McCarron for a 30-yard touchdown pass. Iowa then took its first lead on its next possession. On the first play, Beathard found tight end George Kittle for 51 yards along the NDSU sideline and two plays later, he connected with Matt VandeBerg for a 14-yard touchdown pass with 8:05 left in the first half. After taking a 14-7 lead into the half, there was a 14-point swing at the start of the second half. A 62-yard run by LeShun Daniels, Jr., was negated by holding. Instead of a first-and-goal, Iowa punted following a three-and-out and the Bison tied the game with a nine-play, 65-yard scoring drive. Iowa native Lance Dunn broke off a big 35-yard run to the Iowa 3. Then King Frazier’s 1-yard touchdown run tied the game 14-14 with 8:06 remaining in the third quarter. Iowa took its final lead on the ensuing drive with an assist from freshman quarterback Nathan Stanley. Beathard left the game after getting up slowly following a scramble for a first down on third-and-3 from the Iowa 37. On his first play of the game, Stanley hit Kittle for a 37-yard gain to the NDSU 22 off play action. Iowa moved to the 11 before turning the reins back to Beathard. He closed out the drive with a 9-yard touchdown pass to VandeBerg, giving Iowa a 21-14 lead with 2:12 left in the third quarter. NDSU moved the ball 43 yards to the Iowa 32 on its next possession before Pedersen’s attempt on a 50-yard field goal fell short. The Bison scored the final nine points, which included Pedersen’s redemption on his game-winning field goal. Frazier finished with for 99 yards rushing, Dunn added 61 yards on the ground, and Stick finished 11 of 19 passing for 124 yards. NDSU middle linebacker Nick DeLuca finished with eight tackles, and Grimsley had six stops including a forced fumble. North Dakota State is off next week before opening Missouri Valley Football Conference action in its annual homecoming game Saturday, Oct. 1, against two-time defending league co-champion Illinois State. Iowa, meanwhile, opens Big Ten play next week on the road at Rutgers.